There’s no good time for a laptop to die, but the night before a week’s worth of travel wouldn’t have been my first choice. But that was the scene last Sunday evening, when my 2015 MacBook crashed hard and wouldn’t restart, though it teased me a few times by almost completing a boot cycle before dying. The diagnosis at the Apple Store this morning was a cooked logic board, but either way it meant I was looking at a week on the road with nothing more than a smartphone. Which was not realistic, given even the more limited email volume I handle while on the road. I remain happy with the Pixel I picked up in October, but the prospect of spending a week with nothing but a two inch by one inch software keyboard for a week was a nonstarter. Nor did I have any spare hardware lying around to pinch hit for the trip. As a result, I looked at two possibilities. One, pick up a cheap Chromebook. Two, pick up an iPad Pro and see if i could work off of a tablet. As it turns out, the Best Buy closest to the Hilton in Boston where I was staying – whose exact Chromebook inventory could not be ascertained – was a fifteen minute ride away by car. The Apple store, by comparison, was four blocks. 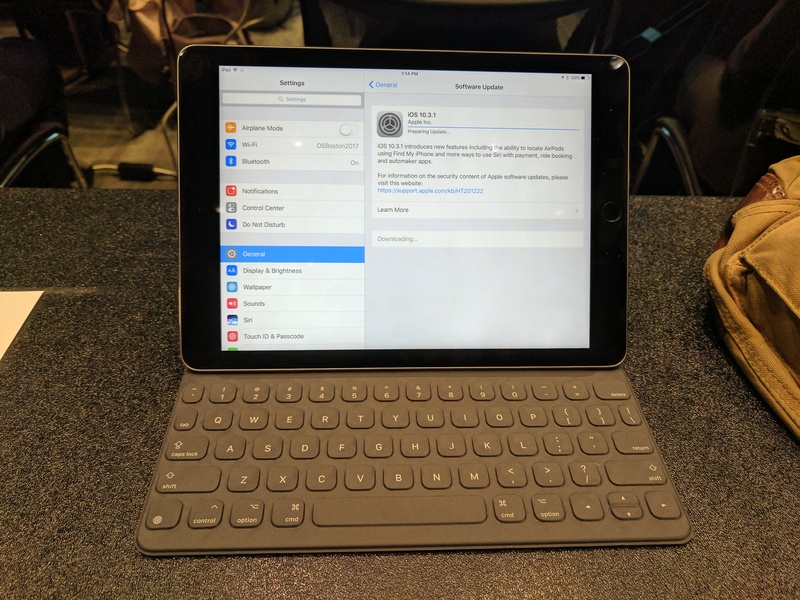 Ten minutes after hopping off the bus in Boston, then, I was walking out of the Apple store on Boylston with a shiny new iPad Pro 9.7″ along with an Apple keyboard case. The experiment had begun. The truth is that I’ve been curious about tablets as a laptop replacement dating back to the original iPad launch. When Cote worked for us and was looking at a laptop upgrade, in fact, I tried to convince him to become my guinea pig. I was not successful. The attraction of tablets for a frequent traveler is obvious. They’re light, and the battery life is typically excellent (I have a desktop computer for anything hard – several of them, in fact – so I don’t need my laptop to be particularly capable). The iPad Pro 9.7, for example, weighs less than a pound and the keyboard cover only adds something like seven ounces. Even my ultralight MacBook clocks in around two pounds. Surprisingly, most of the Chromebooks I looked at weigh closer to three – counterintuitive for a piece of hardware that only runs a browser. For those that don’t travel frequently, the difference of a pound or two doesn’t seem like a big deal. For those that do, it can be a big difference, particularly on longer trips. Just as important, however, is the battery life. Conference days are long days, and typically don’t come equipped with handy power outlets. My MacBook was sold to me with a promise that I’d get “up to” 9 hours off the battery. In my usage, it was usually closer to six even fresh out of the box. I was willing to make this trade for the light weight, but I wasn’t thrilled about it. In other words, I was a good candidate for a tablet conversion. Every time I tried to convert, however, I spent about an hour with a tablet before bowing to friction that while superficial individually was unworkable in the aggregate. The simpler way to put that is that while I genuinely wanted to like tablets, in practice I hated them. Which brings us, finally, to the iPad Pro. As I’ve mentioned a few times in my newsletter, I’ve been following the conversion of some in the Valley to iPad Pros with interest, because strictly in terms of our functional demands on a piece of hardware, there isn’t much difference between a VC and an industry analyst (there are many other differences, however). If they could make the jump, maybe I could too. Hence my interest in the iPad Pro. The biggest single difference for me between this experiment and prior outings with a tablet were being able to a) Cmd-Tab between applications and b) have two applications up side-by-side. Seriously. Just those two features, that aren’t even worth mentioning in a desktop review because literally every desktop considers them foundational, were transformative for me. Instead of the typical mobile experience, I could have email and Tweetbot up side-by-side, for example. Switching back and forth between applications to, say, cut and paste into email was a couple of quick keystrokes instead of a double click of the home button and swipe of the screen. This sounds trivial, and on a purely quantitative basis it likely is. The difference can’t be more than a few seconds, if that. But at least in my experience, that small friction accreted over time, and eventually left me frustrated and unhappy with tablets. Apart from those non-revelatory features, the experience was just fundamentally sound. There were minor irritations here and there – the iPad Gmail client wasn’t allowing me to book calendar appointments for some reason while the equivalent app on my Pixel would. But overall, the performance was more than enough for my basic travel needs – impressive given the underlying ARM platform. The screen is great, and the application ecosystem is extensive and most importantly includes MLB’s At Bat application. The keyboard has its drawbacks, but once you get it seated properly (an issue for me) it’s simple and elegant both in terms of the mechanical connection (magnetic) and the wireless (no messing around with Bluetooth). The battery life is incredible. I got up at 4 AM to catch a flight yesterday morning, was active on the device through two flights (AUS-JFK, JFK-BOS), a layover and a bus ride home from Boston. At 10 PM last night the battery life was 42%. The conventional wisdom on tablets is that they’re for consumption not production. You can absorb text quickly and well, for example, but writing is a chore. In my experience, at least with the Apple keyboard – the Logitech one is supposed to be better for typing but is also heavier – this view is accurate. The machine is capable from a performance standpoint, don’t get me wrong. I used it over the week for some light document editing, some basic spreadsheet work and a lot of email. But while typing on the Apple Smart keyboard is fine, but I wouldn’t want to write anything extensive using it. There’s a reason the words you’re reading right now were written using the iMac in the office, not the iPad Pro. The Smart keyboard case also makes the iPad itself a little unwieldy, whether it’s deployed as a keyboard or not. The good news is that it’s a snap to remove, but then you have a ten inch screen with no protective covering whatsoever. In practical terms, at least for my usage, this means that the iPad is never going in my bag without a covering, keyboard or not. On OS X, my command-tab list is every open application. iOS is much more aggressive at policing these, meaning that pretty regularly I’d have to drop back to the homescreen to bring back up an application I’d been using. Cut and paste is still pretty kludgy. Setup was a reminder just why Alphabet would probably be last on my list of technology providers to drop. From Gboard (to give me swipe typing) to Gmail/Calendar/Docs (which we at RedMonk use) to Chrome, YouTube and Google Music/Photos (which I use personally), most of my Apple experience is actually powered by Google. I’ve never before felt like my Pixel (the small one) was actually small (I hate big phones), but every so often after using the iPad for a while it would seem absolutely tiny. Apple’s default setup of “iMessage: On” temporarily broke my SMS when I activated the device. I love being able to use nVALT 2 for notes on the desktop synced to SimpleNote on the backend – available on iOS – as a note taking setup. There haven’t been many things I’ve tried to do using the iPad and been unable to, but some are harder like controlling the headless Mac Mini server we use at home via VNC Viewer. Private Internet Access, the VPN provider I use, has an iPad client so that was easy. I still very much prefer Android’s notification system to the one iOS uses. Firing up a brand new tablet on a platform I don’t use actively anymore in iOS is a great reminder why I don’t use Apple specific apps. My music (Google Music), podcasts (Pocketcasts), books (Kindle), files (Dropbox), messaging (Slack, primarily) were all available and current in spite of the fact I dropped iOS last fall. One of the folks I spoke with down in Austin spoke very highly of the Apple pen and the ability to take text notes using that form, but I haven’t tried it and frankly writing by hand for me is hard these days. I can barely write a check at this point. Given the productivity issues, you might guess that I’d be returning the iPad Pro as soon as the laptop comes back from Apple repair, and you’d be correct. I will be returning this hardware sometime next week. But not because it doesn’t have a place in my hardware portfolio, but because it turns out it’s a bad time to buy an iPad Pro. When the Apple buyer’s guide tells me not buy something, I don’t. Assuming, that is, my choice is not either buy one or spend a week with nothing but a smartphone. Even with the issues getting text into the device, I was pleasantly surprised by my experience with the iPad Pro. For quick trips, those of a day or two in duration where the majority of my schedule will be spoken for already – which is most of my East Coast trips, at least – it’s a near perfect device given its battery and weight characteristics. And given that the battery and now, in all likelihood, logic board of my MacBook will both be less than six months old, it seems reasonable I can stretch my usage of that machine out a bit making it easier to justify the cost of an iPad. Your mileage may vary, of course, depending on what you need out of a tablet, but if you’re not going to be writing a lot I’d give the iPad Pro a long look.